How it Happened: Heath and Len spent time working the lake in the days before the tournament. Heath said that he likes to spot bass and then catch them while prefishing and see how big they are so he knows which fish he needs to target come tournament day. The team spent time while the winds we down cruising and targeting fish they would see on beds. Without running all over the lake they had spots marked within a couple miles radius they wanted to target Sunday. They stuck around Saturday afternoon checking to see which fish had been picked off by the Cash for Bass guys earlier in the day. 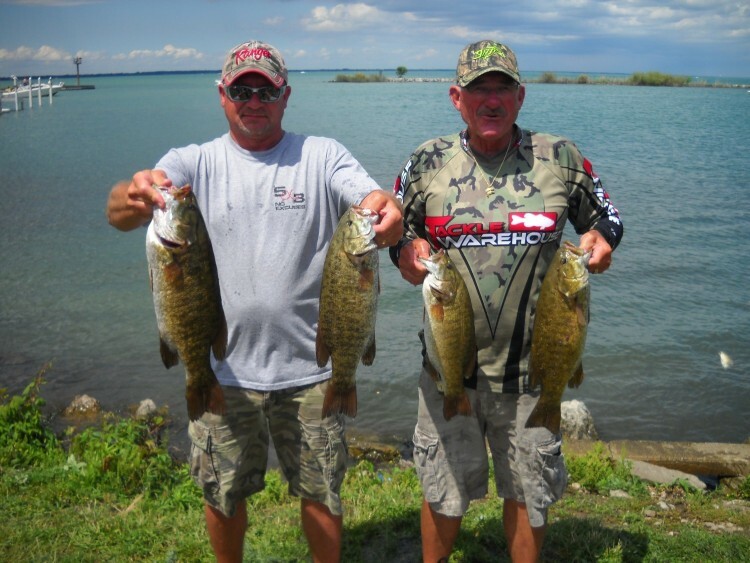 A couple of the 4 pounders they had hoped to fish for on Sunday were gone but a pair of 6 pounders remained. ​How it Happened: The morning started out in what they thought would be a disaster; Looking for a repeat of last year when the team won big bass and cashed the 6th place check, both anglers thought they had blown any chance of doing well. They could not find the spot they intended on starting at and were running around, driving all over. Finally John set the boat down on a spot they fished last year but had no intentions of fishing this year. John felt he needed to calm down and get the situation figured out. Jon started fishing while John looked over the electronics to get them back to their starting spot. While he was looking at the electronics Jon put three fish in the boat. They decided to stay and finished off their limit within ½ hour. 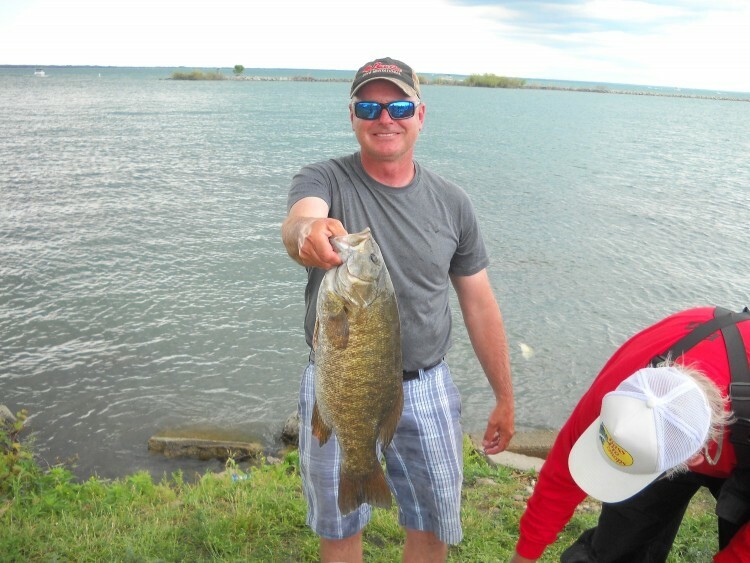 ​The R & B Bass Circuit's Eastern Division 2nd trip to St. Clair proved again what a phenomenal fishery Lake St. Clair is. 34 teams launched at Harley Ensign and in the end 31 limits were weighed in. The weights were up too. Last years winning weight was just a little above what it too to cash in this year. ​​Seven of the Heaviest Weights in R & B Bass Circuit history were weighed!! How it Happened: It took only an hour to catch a limit by drifting through small weedbeds. They repeated the drift all day and it never wavered. Heath and Len started Sunday on one of the big fish. They landed the 6.28 Smallmouth on the second cast. The Second 6 pounder was about 50 feet away but ½ hour and the fish would not relent so they moved on. ​To catch their winning bag they threw a combination of baits. Two of the baits he used with the greatest success were hand poured plastics by Brad Jones. Heath said when bed fishing he likes to throw an Erie Darter as it seems to represent a Goby and really pester the Smallmouth into biting. The darter he was throwing was a Brad Jones Jonesies D. Another one of Brad Jones’s custom baits he was using was a version of the Ned Rig. Heath said the fish seem to be keyed on the Ned Rig right now and several of the fish fell to the Jonesies N rigged Texas. All of their fish came in 5’ or less of water. The team also took home $272.00 for their Native Pride Tackle Big Bass - a 6.28 pound behemoth. This is also the third largest bass in R & B History! ​The team has been fishing together for 17 years and John stated that is was the best limit the two has ever put together. Despite a little wind and a little rain they were excited to see their day come together. ​Baits: The two caught their fish on Senko’s and double ringers rigged Wacky, Texas or on the Drop Shot. They would each swap out to something the other wasn’t throwing until something started working, and then capitalize on it until it stopped producing. How it Happened: Frank and Doyle left home around 2am Sunday morning. With no prefishing time they started their day at Metro. After an hour with no bites they moved to the mile roads. ​​Fishing in the 12 -13 mile stretch they ran across a 50 yard spot in about 8’ of water the seemed as though it produced a keeper each time they passed over it. The next thing they noticed that the larger fish wanted the bait presented slower. They ended up throwing two anchors off the back of the boat. Locked in the middle of their 50 yard honey hole allowed them to dead stick their baits. 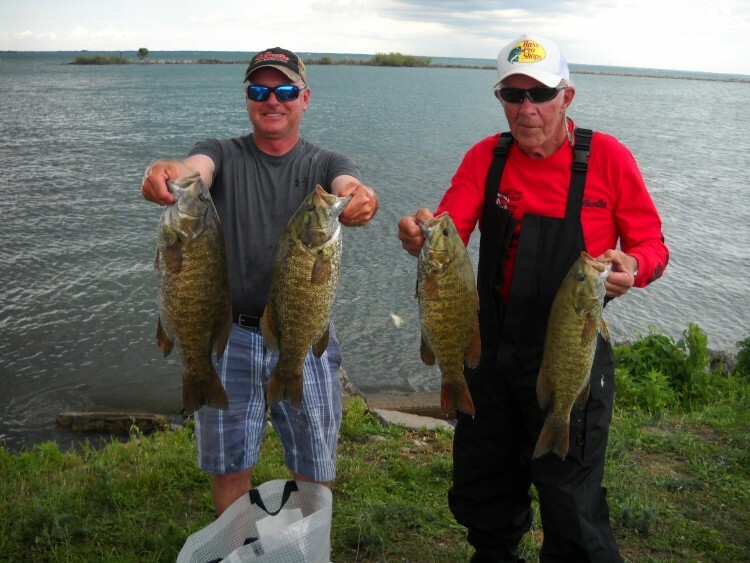 Baits: ​​Doyle was throwing a wacky rigged Senko with a internal weight and frank was fishing a drop shot with a wacky rigged Senko. Frank commented that the larger fish never hit the bait it would just feel heavy. and size of fish, mostly post spawners in 6-11’ feet of water. Two of the areas had a lot of pressure while two were relatively untouched. In practice we caught them with several different baits but the larger fish were coming on rattle trap, drop shot, tubes and spinnerbait. They were hitting the spinnerbait so hard I had the rod ripped out of my hands one time almost losing it. The key was to slow roll it instead of the usual burning it." 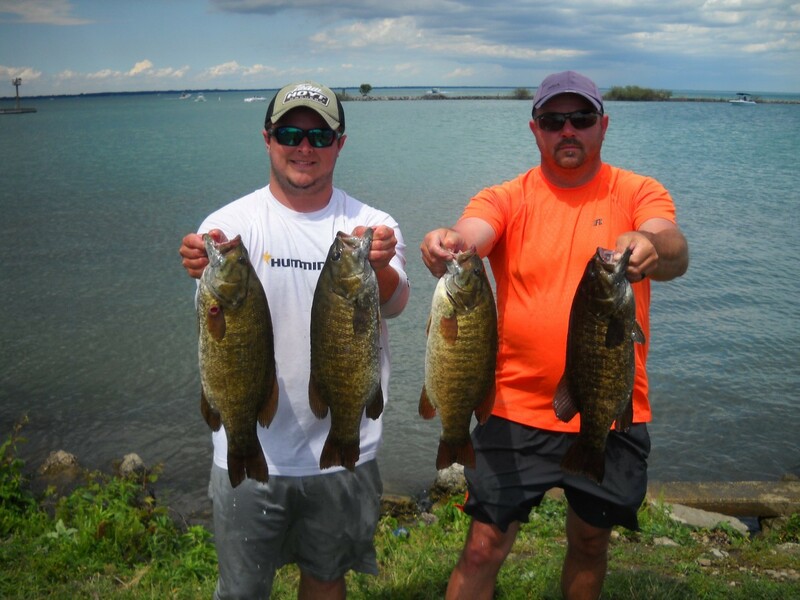 "On tournament day we decided to run south to one of the spots that weren’t hammered by Cash for Bass the day before. It took us 30 minutes to get there because of the rough conditions. We started fishing just after 7:00 and by 7:30 we had roughly 17 lbs in the boat. 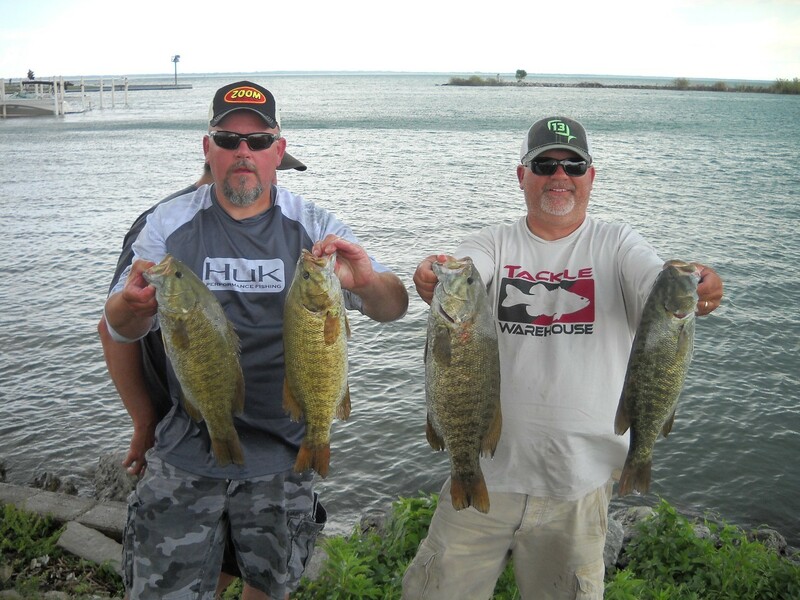 Russ was throwing a spinnerbait and the smallies were crushing it. Brandon started out throwing a rattle trap and had some hits but wasn’t connecting so he changed up to a tube. We continued fishing and upgrading in the same area without ever having another bassboat around. At 12:30 we decided to move where we had caught a couple of our better fish in practice and when we got there, there was a boat directly on the waypoint and several others in the area. We stayed and fished around the area anyways hoping to find a kicker. We were sitting with just over 19 lbs and thought we needed at least one better one. We caught fish but not the size we needed. It was getting close to the time we decided we needed to head in when Brandon hooked into one that gave us our final weight on his last cast with a tube. It was a 4.3 that culled a 3.5 and put us in the 20lb range. 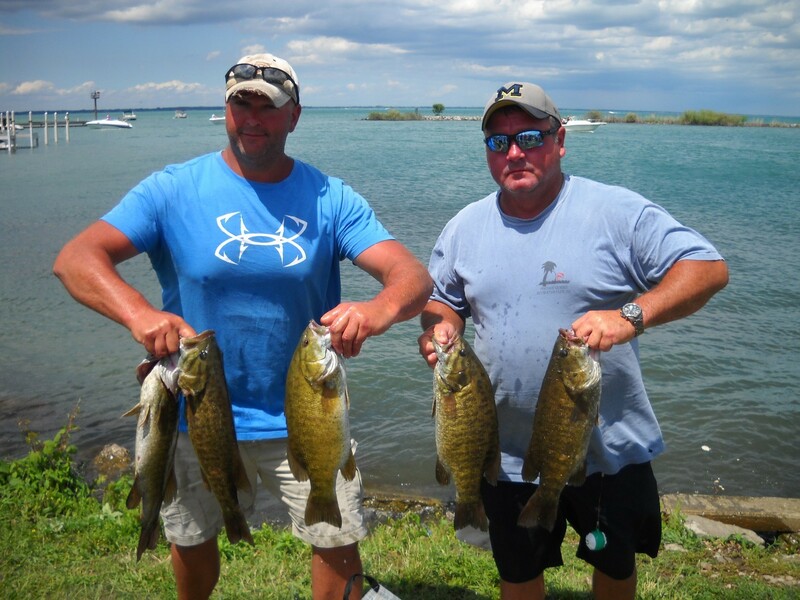 We have been fishing tournament together for about ten years and this was one of our finest, we caught a ton of fish with a lot of good ones."